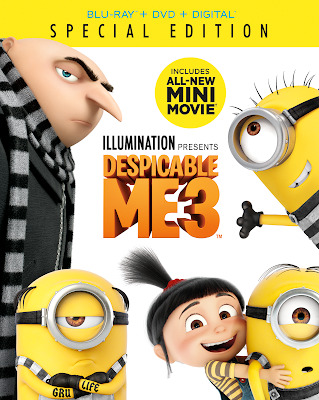 Thanks to Universal Pictures Home Entertainment we have Despicable Me 3 Blu-ray/DVD to giveaway to some lucky fans. Illumination and Universal Pictures Home Entertainment present Despicable Me 3 on 4K Ultra HD, Blu-ray™, DVD and On Demand today. The characters beloved by everyone – Gru, his wife Lucy, their three adorable daughters—Margo, Edith and Agnes—and the Minions provide hours of family fun in this heartwarmingly subversive comedy from Academy Award®-nominated producer Chris Meledandri (Despicable Me Franchise) and directors Pierre Coffin (Despicable Me Franchise) and Kyle Balda (Minions 1 & 2, The Lorax). Hailed as “the best Despicable Me movie yet,” by Ali Plumb of BBC Radio 1, with over $949 million in global ticket sales, Despicable Me 3 is the ultimate holiday gift, with almost an entire hour of exclusive bonus features including an all-new mini-movie, a never-before-released deleted scene, and much more! The film will be available on 4K Ultra HD in a combo pack which includes 4K Ultra HD Blu-rayTM, Blu-rayTM and Digital. The 4K Ultra HD will include all bonus features on the Blu-rayTM disc. • 4K Ultra HD is the ultimate movie watching experience. 4K Ultra HD features the combination of 4K resolution for four times sharper picture than HD, the color brilliance of High Dynamic Range (HDR) with immersive audio delivering a multidimensional sound experience. • Blu-rayTM unleashes the power of your HDTV and is the best way to watch movies at home, featuring 6X the picture resolution of DVD, exclusive extras and theater-quality surround sound. • Digital lets fans watch movies anywhere on their favorite devices. Users can instantly stream or download. • MOVIES ANYWHERE is the digital app that simplifies and enhances the digital movie collection and viewing experience by allowing consumers to access their favorite digital movies in one place when purchased or redeemed through participating digital retailers. Consumers can also redeem digital copy codes found in eligible Blu-rayTM and DVD disc packages from participating studios and stream or download them through Movies Anywhere. MOVIES ANYWHERE is only available in the United States. For more information, visit https://moviesanywhere.com. • Freedonia Visitors Guide — Welcome to Freedonia! See all that the town has to offer with this interactive map. From its world class cheese, to its beautiful coastline, Freedonia has it all! • Wanted Posters — Have you seen these Minions wanted for various crimes?